Teaching writing in small mini-lessons makes writing instruction more attainable and gives students more time to spend during their writing block, actually writing. 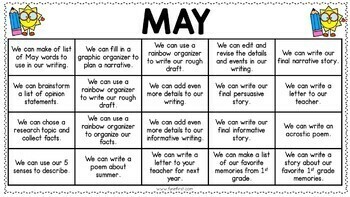 These mini-lessons for May take the guesswork out of what to teach each day in writing. Simply project this onto your screen and click on the day's lesson. Each lesson walks you through the mini-lesson, and then gives the students a writing activity to complete. 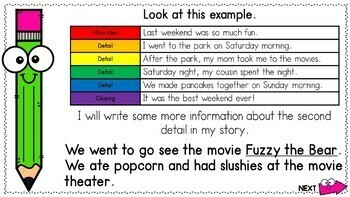 This file also includes a printable writing journal with each of the lessons. What does this product include? 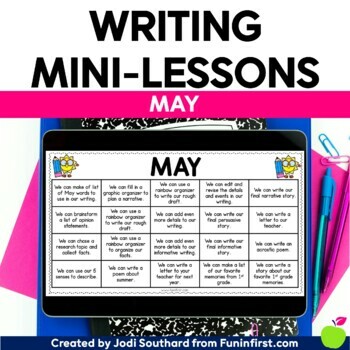 Each month includes 20 projectable writing mini-lessons as well as a printable writing journal to go along with the mini-lessons for that month. Who is this product geared towards? This particular packet is geared towards 1st grade, but could possibly be used in a kindergarten or 2nd grade classroom. How do I use this product in my classroom? Print off the journals along with the cover page for the month. Then, each day of the month, click on a new mini-lesson. 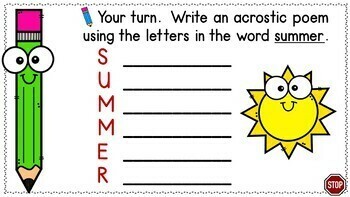 Each mini-lesson will have a writing task for the students to complete in their journals. You will need Powerpoint to open the digital file for the projectable lessons. Be the first to know about new products, sales, and freebies. Look for the ★green star★ next to my store logo and click it to become a follower.